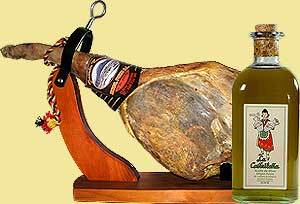 What gives the Serrano and Ibérico hams of Spain their unique flavour? There is nothing more highly regarded in Spain than its dry-cured hams. Although it is, quite rightly, regarded as one of life's rare delicacies, jamón serrano is a normal part of everyday life in most Spanish homes. There you will find it in a prominent place, with its knife conveniently placed, just asking to be carved and eaten. The idea being that you take a few small slices as you pass by for a tasty tapas treat as and when the fancy takes you. But how many of us know what goes into the production of these hams and what the main differences are? Like all meat foods, the quality of Serrano and Ibérico hams depends entirely on the type of pig it comes from, how it is reared, what it is fed on and how it is cured. The other difference, of course, is which leg you choose. 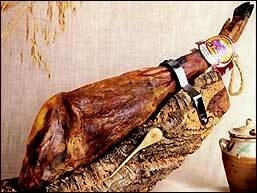 The back legs are heavier, the better quality and are called the jamón. The front legs are called the paleta. So let us have a look at our lovely Spanish pigs and see what influences the quality and flavour of the hams that come from them. Far and away the best of the Spanish pigs is the Iberian hog. Only the hams that come from these pigs can be called Jamon Ibérico. These pigs give us the highest quality hams and are descendents of the wild boar. 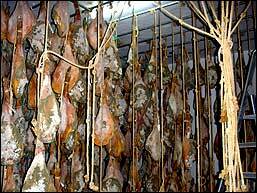 They only account for about 5% - 10% of all Serrano hams because of their expensive rearing and feeding requirements. Originating from and still reared in the south-west regions of Spain, Iberian hogs have longer legs and more pointed snouts. Their grey skin and almost black hoofs give them their famous Serrano name of Pata Negra which, literally translated, means 'black foot' (or hoof). This wonderful breed has the ability to store larger fatty deposits that create the yellow fat that gives Iberian ham its beautifully marbled texture and distinctive aroma. Of the Iberian pigs, the finest quality hams come from those that have been reared free-range in the mountains and fed exclusively on acorns (bellota). These live a life of luxury rooting about in oak forests until the day of their demise and it is the acorns which gives them their unique flavour. Next in quality still comes from the Iberian pig but one that has been fed on a mixture of acorns, pasture and authorised commercial feeds. This ham is called Jamón Iberico de Recebo and is a good compromise for those who do not want to break the bank on a Bellota ham but still want to experience the superb taste and texture. Finally, we have the plain Jamón Iberico, also known as Jamón de Pata Negra. Let me assure you though, there is nothing 'plain' about this superb Ibérico ham. 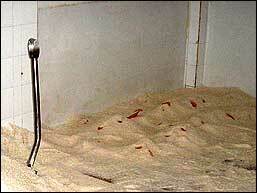 It still comes from the Iberian pig, but one that has been fed and reared on commercial compound feeds. Nevertheless, it is still a delicious and a special taste experience. After the hams of the Iberian pig we have the hams of the 'white pigs'. The white pig can be a mixture of different breeds, such as Duroc, Landrace, Large White and Jersey. 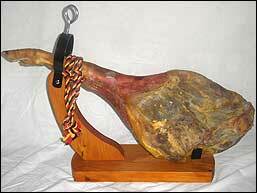 From these come the Serrano hams, which are by far the commonest hams, produced in Spain. 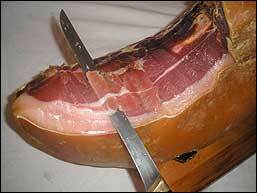 They account for around 90% of all Spanish hams sold and are known by various names. The main ones being 'Jamón Serrano', 'Jamón Reserva', 'Jamón Curado' and 'Jamón Extra'. No special feeding methods here, just authorized commercial compound feed. But, yet again, they are outstanding hams. It is worth noting that the words Serrano, Reserva, Curado and Extra do not really tell us much about the quality of the ham. This is down to individual brands and producers, and can be hard to differentiate. But if you want a fairish indication as to the quality of Serrano ham, you can't go far wrong by looking at the price tag! That has about covered our lovely porkers while they are alive - let us find out what happens after they have made the ultimate sacrifice. By the way, the Spanish breeders of these noble animals do actually still refer to their slaughter as 'sacrifice'. Seems like a much more respectable term, don't you think? To get our Serrano ham, the pigs are 'sacrificed' in the winter and the hams are packed in piles of salt to help dry and preserve them. The length of this salting process depends on temperature and the weight of the ham but is usually around one to two weeks. 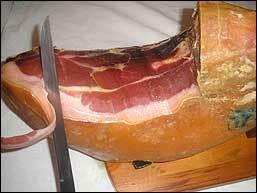 The minimum amount of salt is used because a Serrano ham that is over-salted becomes heavy and tough over time. The salt is then cleaned off and the hams are hung up to dry, for between one to two months, at a temperature of between 5ºC to 10ºC and a high humidity of 75% - 80%. This period is called 'asentamiento' and concentrates the flavour by drying out the moisture and infusing the ham with the remaining salt. Next comes the real curing process which turns the white fat to yellow, transforms the meat into its deep ruby colour, and gives Serrano ham its characteristic aroma. This lasts between six to tweleve months with the meat adapting to the temperature and humidity of spring and summer. After the first month or so of this, the hams are covered with a blue-grey mould. It does not look very appetising but this is what gives it its aroma because in the summer, as the hams sweat off the fat, the odour of the mould infuses into the meat. During the last month or so of the curing period the hams will go through 'maduracion'. This is when the temperature and humidity is dramatically increased to spread the fats throughout the ham and increase the flavour. After this carefully controlled process the hams will have lost 20% to 40% of their weight and will be considered ready for sale. At this point most of the hams will indeed be shipped out. 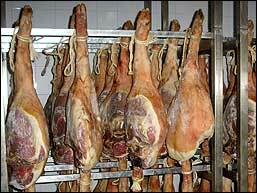 However, the finest Ibérico hams will now be transferred to caves or 'bodegas' for another tweleve to eighteen months. This extra curing period is called 'añejado' and gives these hams their celebrated complex flavours. The end result is Jamón Ibérico de Bellota. A sweet, dark red meat marbled with rich golden fat and infused with the nutty flavour of its staple diet: the humble acorn. You can't get better than this, my friend. Try it and see if you don't agree.